The team’s first year on the court (1967 – 1968) had to be considered a successful one, especially attendance-wise. 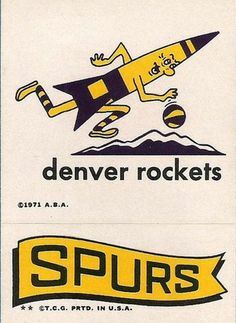 Unlike other ABA teams, Denver started out very slow at the gate. Only 2,748 fans attended the Rockets’ first home game against the Anaheim Amigos. But, attendance picked up over the course of the season, as Denver residents gradually warmed up to their new pro team. In their inaugural season, the Rockets averaged a healthy 4,128 fans per game. This figure encouraged the Ringsbys and confirmed that Denver could, indeed, support a pro basketball franchise. On the court, the Rockets were good, but not great. The Rockets had two powerful offensive weapons. Larry Jones (from Wilkes-Barre of the Eastern League) soon served notice that he was one of the quickest, deadliest guards in the ABA. At times, he was a scoring machine. On November 28, 1967, he scored 52 points at home against the Oakland Oaks. He averaged 22.8 points per game that first year, and was named First-Team All-ABA. Despite Jones’ spectacular play, Willie Murrell (also from the Eastern League) was voted the team’s MVP. Murrell averaged 16.4 points and 9.0 rebounds for the season. Other original Rockets were Byron Beck (out of Denver University), Wayne Hightower (from the Detroit Pistons of the NBA), Lefty Thomas (from the Harlem Clowns), Julian Hammond (out of Tulsa), and Tom “Whammy” Bowens (a great leaper, out of Grambling).